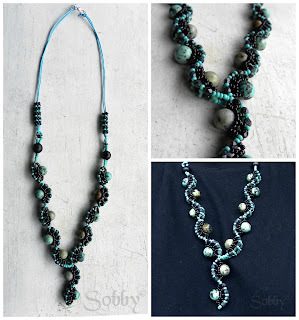 I just completed something I shouldn't have started in the first place, having so many things to finish before Easter vacations...but I saw a Naoko Sugita necklace and thought it was the perfect technique to use these amazing African turquoise beads I had just bought. I try to avoid simple stringing, I love to find new ways to use round, big beads involving small seed beads, without embezelling them completely. Now off to my Bead soup pieces!!! Oh my, that is GOR-juss!! Love, love, love it especially on that dark top. Nice work! I try to avoid stringing as well LOL...hate it! Pics don't do it justice, especially in this grey weather!